TongaFootball > News > FIFA Women's Football Administration Course > Women’s Football takes on to wider horizon! Women’s Football takes on to wider horizon! This course was conducted by Ms Hearther Reids of Australia. Reids had almost 40 years of experience in football as a player, coach, manager and leader, especially in the development of opportunities and programs for girls and women. She started her career in the women’s game but for the past 12 years she has been CEO of the ACT Football Federation (Capital Football) in Canberra. Whilst in this position Reids has had responsibilities for men’s, women’s and junior football (inclusive of futsal) catering for over 20,000 players across 47 clubs as well as coaches, referees, volunteers and managers. Reids has been recognised for her services to women and sport, and to football by being inducted into the Football Federation Australia Hall of Fame, and in 2015 she received a plaque on the Walk of Honour by the ACT Government in Canberra and also received an Australia Day Honours as a recipient of the Member of Australia medal. With her expertise and experienced she leads this course to reach the objectives in getting all participants to draw out a marketing plan on how to increase more women to play, to coach, to referee and to managers even to volunteers. Also they discovered leadership qualities. They were also taught of how to prepare a financial planning for their own football clubs also project managements. Participants were fully geared up and they were also very enthusiasm to carry out what they partake in this valuable course. Her football club was established in 1996. Reids Heather’s depth of experience in football has also led to her being appointed as a mentor on the FIFA Female Leadership Development program that will commence in one week time. In this role, she will share her knowledge, contacts, support and expertise with two or three mentees from around the world. 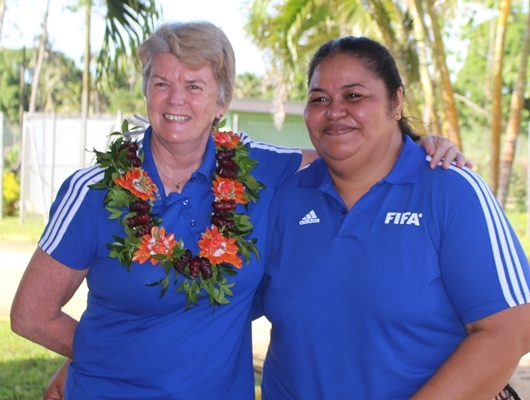 Tonga Football wishes to extend their gratitude and appreciation to Reids for the job well done, and to wish her the very best for her coming mission! Previous Post FIFA Women's Football Administration Workshop for five days! FIFA Women's Football Administration Workshop for five days!